Parasitologists have estimated that parasites comprise over half of all animal species. That said, many regions and ecosystems remain understudied for parasites, despite free-living groups having been routinely sampled; this is especially true for the marine environment. Over the last 16 years, we have made much progress on documenting the metazoan parasite biodiversity globally, specifically of tapeworms that, as adults, parasitize the digestive tract of sharks and rays. Among the 18 orders of tapeworms currently recognized, seven orders exclusively parasitize sharks and rays. Although more than 930 species of tapeworms that parasitize sharks and rays as adults have been described, it is clear that this number represents only a small fraction of the vast diversity of shark and ray tapeworms that remains to be described. We have concentrated on the orders Lecanicephalidea and Tetraphyllidea, which collectively comprise a total of ~550 species and exhibit strict specificity for their elasmobranch host. Within this system, major ongoing research involves the investigation of tapeworm morphology, systematics, biodiversity, coevolution, pathology, and life cycles. In addition, patterns of host associations and geographic distributions are a central focus. Techniques employed to obtain data to address these questions include, but are not limited to, light and scanning electron microscopy, confocal microscopy, histology, and Sanger and Illumina sequencing. This NSF funded project (2008–2015) is a collaborative effort among cestode experts from 21 countries around the world. Its primary goal is to expand knowledge of tapeworms globally. Thus, in addition to discovering novelty through examination of vertebrate hosts and geographic regions that have not previously been explored for tapeworms, it aims to compile and synthesize existing taxonomic information on cestodes so as to make it easily and publicly available. Furthermore, it aims to provide a database system for effectively tracking host/parasite data. The population of the Global Cestode Database was central to this project. All associated databases, (e.g., Tapeworms Species, Host Specimens, Citations, etc.) can be accessed from the project website house at the University of Connecticut. To date, the project participants have collectively (1) described 162 new species of tapeworms, (2) erected 2 new suborders, 1 new subfamily, and 47 genera, (3) visited at least 30 different countries, and (4) have published 154 papers citing the grant. 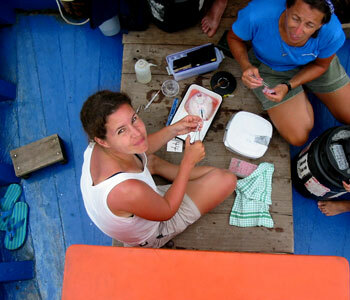 In 2005 and 2013, we had the opportunity to travel to Taiwan and, in collaboration with Taiwanese elasmobranch biologists and parasitologists, collect tapeworms from sharks and rays throughout coastal Taiwan. While the relatively small island of Taiwan is home to ~177 of ~1,155 species and 50 of 57 families of known elasmobranchs, little is known about their tapeworm fauna. Just this year, resulting from these collections, we described a highly unusual new tapeworm in the order Litobothriidea, Litobothrium aenigmaticum. At the site of attachment, the host’s intestinal mucosa is expanded into a papilla-like structure indicative of pathological change. In addition, Rachel is working on the lecanicephalidean tapeworms from the Japanese sleeper ray, Narke japonica, from Taiwan and will present her results at the annual meeting of the American Society of Parasitologists in July 2014. Search the Global Cestode Database.